A franchise that stands out from the rest. 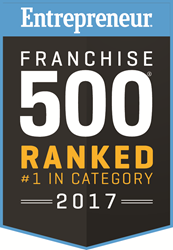 ASP, the #1-ranked franchise in its category by Entrepreneur Franchise 500. From day one we have put the needs and satisfaction of our franchise owners at the forefront of everything we do, while also reinvesting in our brand. ASP - America’s Swimming Pool Company is the nation's largest pool cleaning, repair and renovation franchise system. This company began as a one-man operation and has quickly developed a reputation as the “best of the best” in the swimming pool service industry. Entrepreneur magazine recently named the top 100 companies that are worthy of the 2017 Best of the Best rankings, and ASP is proud to hold its recognition as the best in its industry. Their pool professionals have what it takes to be part of the number one swimming pool cleaning, repair and renovation franchise because of its proven system and successful business model created by Founder and CEO, Stewart C. Vernon. “Making the Best of the Best list is a true testament to the power of our brand, and the leaders we have leading the company,” said Vernon. “From day one we have put the needs and satisfaction of our franchise owners at the forefront of everything we do, while also reinvesting in our brand." The Entrepreneur Franchise 500® ranking is already a competitive environment, and to be named the best in the industry is something to brag about. Entrepreneurs and franchisors recognize the Franchise 500 as a top competitive tool of measurement highlighting exceptional performance in areas including financial strength and stability, growth rate and brand power. Other features that determine the Top 100 list include years in business, startup costs, litigation brought by franchisees, franchise terminations, and whether financing is available. Technology and innovation in the pool industry are other contributing factors to ASP’s continuous rankings. Their team of experts designed PoolOps® technology, a cloud-based digital platform created for pool professionals by pool professionals. This type of innovative technology is used to provide a higher level of service to their customers while integrating a marketing platform to help target and capture high-quality leads. To view America’s Swimming Pool Company in the full ranking, visit http://www.entrepreneur.com/franchise500. America’s Swimming Pool Company is the largest swimming pool cleaning, repair and renovation franchise system in the nation. Founded in 2002 by Stewart C. Vernon, the company is based on the belief that by providing a higher quality pool service at a reasonable price, the brand would raise the industry standards for pool service. In 2005, ASP began franchising and now covers 245 territories across the nation. For more information on ASP’s swimming pool franchise opportunities, visit ASPfranchising.com. For more information on ASP-America’s Swimming Pool Company, visit ASPpoolco.com. Follow us on Facebook @asppoolco.